Tallahassee author Adrian Fogelin doesn’t have to travel to exotic places to dream up ideas for her novels; she just steps outside her home of 20 years in Seminole Manor to talk to her young neighbors, whose lives are filled with hopes, challenges and dreams. In spending time with the kids in her area, Fogelin, an award-winning writer of middle grade and young adult fiction, has come to realize that her young neighbors are “exposed to reality very, very early.” The issues that they face can be troubling, but the way in which they face them can often be inspiring. Both ideas are reflected in Fogelin’s novels, which feature ordinary kids and address universal coming-of-age themes with honesty and optimism. Her characters experience struggles and triumphs that help them to learn about who they are and find their place in the world — even if it’s just the world of Tallahassee. Although she is the author of nine published books, several of which have been translated into multiple languages, Fogelin is, admittedly, “not a business person.” Instead, her skills lie in other areas: Aside from being a writer, she is a devoted wife, mother, grandmother, artist, gardener, freelance book editor, musician (half of the popular duo, Hot Tamale), educator and co-founder of the innovative Front Porch Library. The Front Porch Library was created in 2009 in the winter home of Fogelin’s late father. 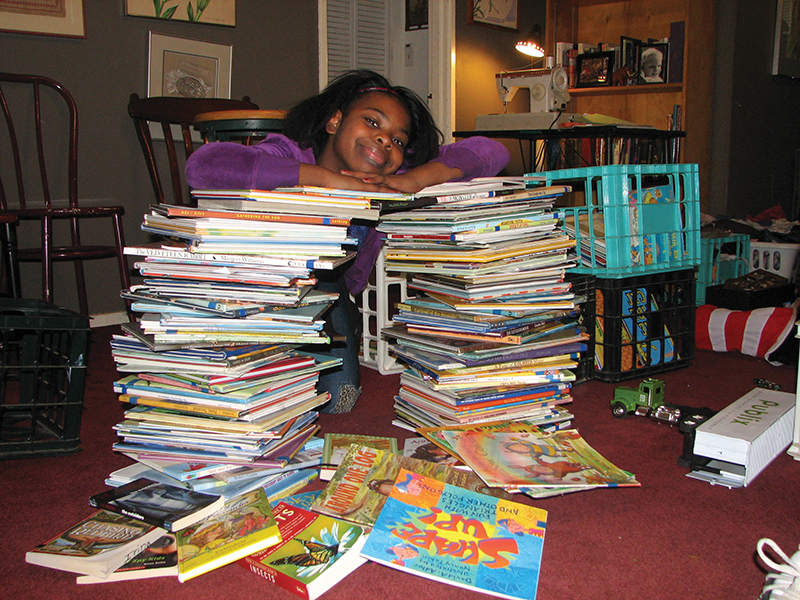 What began as a collection of books placed on the front porch for neighborhood kids to read has evolved into a much-valued neighborhood resource with a collection of over 3,000 books. Seminole Manor youngsters can get a library card and check out four books at a time, with no due date. “The Front Porch Library means access to books for kids whose families don’t have many — or any — books,” said Kary Kublin, a Tallahassee educator and the other co-founder of the Front Porch Library. Every Sunday afternoon, anywhere from a handful to 15 or more neighborhood kids stop by the Front Porch to participate in games or activities, organized by Fogelin and volunteers, that involve science, history, nature, music or storytelling. Although Fogelin adores her neighborhood, she does venture outside of it — particularly willingly when she visits Tallahassee schools to present her “Think Like an Author” creative writing program for fourth graders. A number of those issues, which include racism, poverty, fitting in and acceptance, are captured in Fogelin’s acclaimed, six-book “Neighborhood” series, of which “Crossing Jordan” is the first installment. Family is important to Fogelin, whose mother, Maria Bontempi Fogelin, was a prolific novelist. Adrian Fogelin was born in Pearl River, New York and studied sculpture at the Rhode Island School of Design. She met her husband, Ray Faass, while working as an illustrator at the Baltimore Zoo. They have one daughter, Josie Faass, and a grandson, Matt. The author of nine published books, Fogelin lives, writes and jams (she’s one-half of the band, Hot Tamale, with Craig Reeder) in Tallahassee. For more information on Fogelin, visit adrianfogelin.com. To learn more about her music, visit hottamale.weebly.com. To find out all about her neighborhood project, the Front Porch Library, visit thefrontporchlibrary.com.